I disagree with the downgraded ranking. I believe Dartmouth’s undergraduate teaching is top-notch. The small class sizes for the majority of courses are conducive to fruitful class discussions, and the openness of professors’ office hours promote strong professor-student interaction. I often go to my professors’ office hours, and I am constantly impressed by how they make themselves available to students and how they genuinely want us to succeed. Perhaps one way that Dartmouth could make its undergraduate teaching even stronger is by making introductory STEM classes smaller in size. I sometimes find that, even though there is limited class discussion compared to humanities classes, it is easier to get lost during lectures in a giant class, and I am less likely to ask questions. While I believe, from firsthand experience, that Dartmouth remains one of the best undergraduate experiences in the country, it’s extremely alarming to see the drop in rank. In looking at the rankings, I think it’s important to remember what factors into each specific category ­— which, in the case of the undergraduate teaching rankings, are based on the reviews of top academics, the peers of our faculty and our administration. As this drop is not just a drop in merely one or two positions for Dartmouth, I find the change incredibly significant. Given other factors of growing discontent on campus in the past year, it makes me wonder why Dartmouth specifically has dropped so far in the estimation of the peers of our faculty and administration and what this drop might be based on. As Dartmouth students who have seen the College’s teaching standards for ourselves, we are uniquely qualified to comment upon its exceptional quality. No matter what U.S. News and World Report tells us, it is obvious to me that the learning experience at Dartmouth is of a quality unmatched anywhere else. The passion that our faculty brings to our college and the intimacy with which students are introduced to their teachings are unparalleled among learning institutions, and without having taken classes here for oneself, it is impossible to truly grasp how unique the Dartmouth experience is. That said, our falling rankings should serve as a wake-up call that the world is taking notice of our administration’s lack of proper management. The low numbers reflect poor leadership — not poor education. 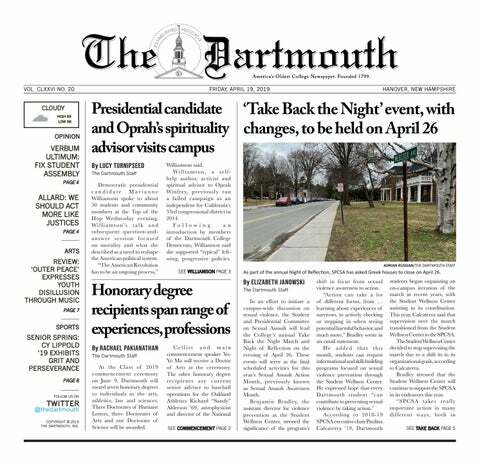 The fact that Dartmouth dropped significantly in the ranking this year somewhat reflects the administration’s largely misguided priorities, which have relegated excellence in undergraduate teaching second compared to superficial and largely nonessential qualities. Rather than taking pride in our traditions, our distinct and engaged undergraduate faculty or our vast mine of international opportunities, the administration seems to have opted for a different focus. Purely from a budget perspective, we need more competitive compensation for faculty and even smaller class sizes to attract professors as well as investment in new study abroad opportunities and those that already exist. We already have a beautiful campus, and the current heavy spending on infrastructure seems extravagant and misplaced. For example, the housing system is fine but shouldn’t require such a hefty price tag. Rather than trying to change so much of the College’s identity and focusing so much on its outward appearance, we need to refocus our priorities, take pride in our strengths and drastically alter our course back toward the values that made this institution the place I am proud to call home.